Grand caravan did not Dodge the grand convenience. Simply amazing. I have owned the vehicle for a half year, bought used. I have had limited issues with the vehicle at this time, however, I have noticed issues with the electrical in the car. Interior lights flickering, stock stereo having issues seemingly related to power, as well as a random dimming of my dash. The battery and alternator check out so I will have to search deeper for the issue and hopefully it is nothing crazy. Apart from that, the only other issue I have is fighting with my side doors from time to time to get them to close. The automated closing function seems to be sporadic and at times when I try to manually shut the door, so that I can close it quicker, it will not disengage the automatic closure. But this is such a minute issue. However, the vehicle is very comfortable and has given me no issues with reliability currently. The zone temperature controls between the front and back are really handy for someone like me. I do not like to be hot and will use the cold air even during winter, though I can set the passenger side and the back compartment to be warmer as needed for everyone's comfort. The ability to fold away every seat in the back cab portion allows for a lot of utility, and even when the seats are out and available to use, you can utilize the compartments that would store the seat for additional cargo space as needed. I recently took a 7 hour trip out of state and had no issue making it the whole way there and the whole way back with a single stop each way. Another little side note: fixing small issues like bulb replacements for headlights and tail lights are the easiest out of every vehicle I have owned. Last 7 years, I have never had a problem. Not a single problem. 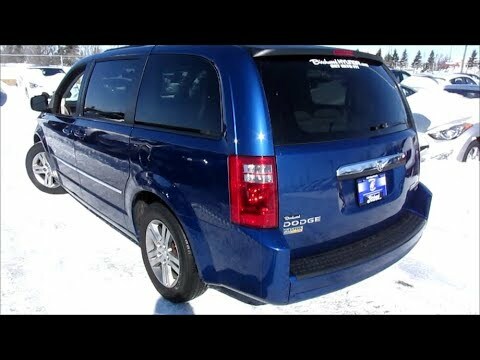 The Dodge grand caravan is wonderful for a family. There is plenty of room for kids, their stuff, and friends. Travel is comfortable and luggage easily attaches to the luggage rack on the roof. The DVD players are a nice feature, as well as the remote opening side doors and hatch I love the stow-n-go seating. Being able to drop all the seats into the floor is so easy and there's so much room. When the seats are up and in use, the extra storage underneath is great for jumper cables and any extras. The grand caravan is absolutely the most reliable vehicle. I have never had any issues outside of regular maintenance. We bought the van in 2011 and it is still just as reliable as when we first purchased it. I don't see the need to purchase another one any time soon. Most family friendly but still versatile vehicle out there! I love that the doors slide instead of swinging, since we have lots of kids; no bashing the vehicles next to us! I also love that I can remotely open the doors so if it is raining or I am in a hurry the kids can start loading up while I put whatever stuff we have in the back. The foldaway seats turn it into basically a truck in a snap! It is also great that the floors are flat and not too low because I have used them as a changing table more times than I can count. It is roomy enough to change in, and we've even put the seats down and slept back there when camping! It is not too bad on gas and really comfy for long car rides.